Bell & Colvill, based at West Horsley, in Surrey, are Lotus dealers and are still in operation until this day and are possibly the longest service Lotus dealers in the country. 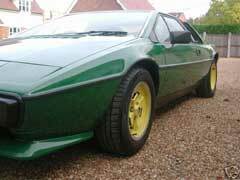 In 1978 they announced their very own privately financed turbocharged conversion based on the Esprit S2. This car, of course, was the 2-litre model, and the turbocharging layout was totally different. There was a single and very large SU carburettor upstream of the turbocharger. Peak power was quoted at a whopping 210bhp. The Bell & Colvill car was undoubtedly very fast, with a claimed top speed of more than 150mph!!! Bell & Colvill produced a mere 25 of these beautiful iconic pre-production prototypes, thus making these particular turbo models incredibly rare and collectible. 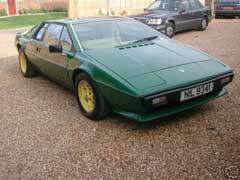 REMEMBER - These Bell & Colvill S2 turbos are the ONLY reason (unconfirmed) why Lotus decided to produce a factory turbo-charged version of the S2 Esprit! How can you put a price on such a rare beast? I know one thing - what ever it`s worth now, it will be worth twice as much in 5 years time, and considering you can`t find a decent factory S2 turbo for under £7000 - god only knows what a Bell & Colvill turbo must be worth??!! As you can no doubt see by the pictures this particular vehicle is an absolute corker. The paintwork can only be described as nigh on perfect, which is no surprise as the vehicle comes with a full photographic history of when it was fully restored. 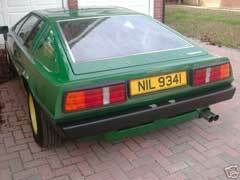 She was originally black, but on a special car it deserved a special paint-job, so it was decided Green & Yellow, the original Lotus racing colours!! 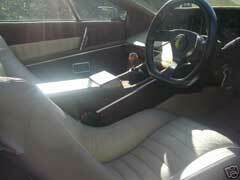 The interior (although very seventies!) 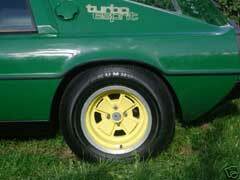 is in very good condition and would suit huggy bear down to a t. The engine is as it should be! She comes to you with a fountain of paperwork including, all previous mots, details of all previous owners - including Bell & Colvill themselves and is the actual car photographed in the Graham Robson Lotus handbook (Included) shown below. Also amongst this mountain of paperwork is an original double spread paper article on this particular car. Lots & lots of paperwork detailing mechanical work carried out on this vehicle. All in all you would be buying into a piece of pure British motoring history, that in my opinion could only go up in value! 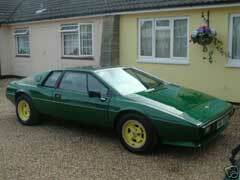 I`ve seen these vehicles (if you can find one) advertised for as much as £14000!!! This vehicle because of its condition and heritage has the potential to have possibly no upper value in years to come - Just think about it!! So come on boys - treat yourselves! You most definitely wont regret it! !